fool me once. bangkok to phnom penh. | take your marks. go. fool me once. bangkok to phnom penh. We were told to be careful in Cambodia, we’d read about the culture of bribery and knew the historic corruption of government that still plagues the country. Our neighbours in Aus had warned us countless times, be careful of pickpockets, don’t pay bribes, they’d drilled us in basic etiquette and given us enough Khmer to endear us to the locals, to be polite and to make sure we got off on the right foot. Everything we were expecting Cambodia to be, Thailand was. The bus journey itself was actually perfectly fine. Long, but then we were traversing a fair distance. 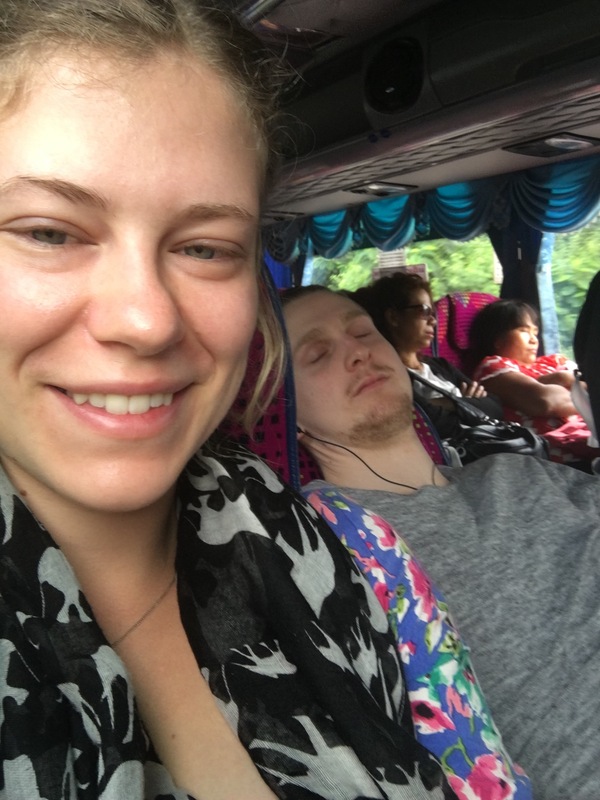 Zac having a snooze on the bus – opportunistic selfie! Side note, how puffy does my face look?! The seats were comfy enough. They reclined a fair amount which was brilliant for Zac, who almost had enough room to stretch out, they gave us food (crab fried rice – I’m sure it would have been nice, if not for the risk of death) and a can of iced coffee in a can that just would not be crushed. Our bags were checked all the way through and despite the fact the drivers didn’t speak any English, they were for the most part, as helpful as they could be. The real horror was with the actual border crossing. wait, there’s two 3:30s in the day? An early start (3:30am, the bus was leaving at 5am and we needed to be at the bus station by 4:45 at the latest) we managed to hail one of the bright pink taxi’s that swarm Bangkok within a few minutes and 60THB later we made it to the bus station. Checking in at gate 22 in Mo Chit 2 Bus Terminal, the first twinges of concern about the journey began to set in as the gentleman at the desk took an unusually long time to confirm our tickets. As it turned out, he couldn’t get the computer to work so we sat, slightly anxiously waiting to see if we’d still got our seats on the bus. Tickets eventually in hand, we then shuffled through to another waiting area where bus after bus drove in and then away, keeping an ear out for ‘Phnom Penh’, and then in the end just following the other white people. 12 hours in this? bring it. Bags loaded, allocated seats turned out to be more of a formality than anything. There were people already in our seats at the front of the bus, so Zac ushered me in to the next nearest seat – this turned out to belong to one of the drivers and after what I think was a telling off, we were sat down in what was deemed the next best seat to our original choice. Narrowly avoiding confrontation with a fluent expat, who’s seats we’d stolen, we sat rather sheepishly in our new seats, feeling inadequate at our inability to communicate. The bus left a few minutes after 5, with the sun only just starting to peek over the horizon, for the most part the bus was full of sleepy travellers. At 8:30am we had our only toilet stop – there was a toilet on the bus, but general consensus is always to avoid unless desperate. There were stalls to buy snacks at here, but we’d got a few things from the 7-Eleven in the bus station to keep us going. It’s important to note that you should probably overbuy on the snacks. We had a box of crackers and a large bag of crisps to share and it wasn’t enough. We were ravenous by the time we got to Phnom Penh – not being able to eat lunch obviously didn’t help, but if you’re vegetarian, you’ll definitely need to buy your own food pre-departure as a veggie option is largely not a consideration. Our bus ID tags, which did nothing to protect us from he predators at the border, as other more fortunate travellers suggested. excuse me, my passport, i need that. Zac made it off the bus before I did, but I wasn’t deterred, after all, I’d done my research, I knew not to let anyone ‘give us help’, that the visa was only payable in US$ and anything else was a scam. The only thing I didn’t know was where the actual border crossing was. Swarmed by Thai men asking for our passports, I was trying to find Zac to take him aside and regroup, have a quick debrief and then continue on our way. All I needed to know was where the crossing was. Truck after truck went by as I was working out which direction the crowds were walking in. Everyone else from the bus seemed to have disappeared, with only the Westerners remaining, being guided over to the Twin Goldengate Travel Co. ‘Office’. The alarm bells had stopped ringing and there was just an air raid siren going off in my head. I was trying to tell Zac that I didn’t want these guys to help us, we were doing it ourselves, but in the confusion he’d already got the passports off me and handed them over to our ‘guides’. There was a Thai shark per passport, a shark cutting out our passport photos for us, another shark filling in a form and two more talking to us. All hungry for fresh meat. I could see Zac getting more and more flustered and I was trying to get him to retrieve our passports and leave, when the men who had our passports disappeared into the office to start processing our visa. With a sinking feeling, I folded my arms and bit my lip to fight back the tears. “How much?” I heard Zac asking. He looked at me and I shook my head: “It’s $30 US each, that’s what we have we don’t have baht.” I repeated myself a few times to no avail, being talked over and tutted at before Zac offered to go and get the money out. I looked into the office and realised our passports weren’t there. Not wanting Zac to get any more anxious than he already was, I sighed, looked in to his pleading eyes and told him to get the money. We were going to have to buy our way out. I sat down on the bench, seething and frustrated and wishing I’d been more forceful, or briefed Zac before getting off the bus instead of assuming he’d know not to get swept along with offers of ‘help’. Zac was pacing up and down. By this point I’d gone through the 7 stages and landed on acceptance. We had to act on good faith that the bus was going to wait for us, we couldn’t go anywhere without our passports and the more frustrated we got, the longer it was going to take. Eventually Zac sat down with me and once he’d noticeably calmed down, within a few minutes we got our passports back. 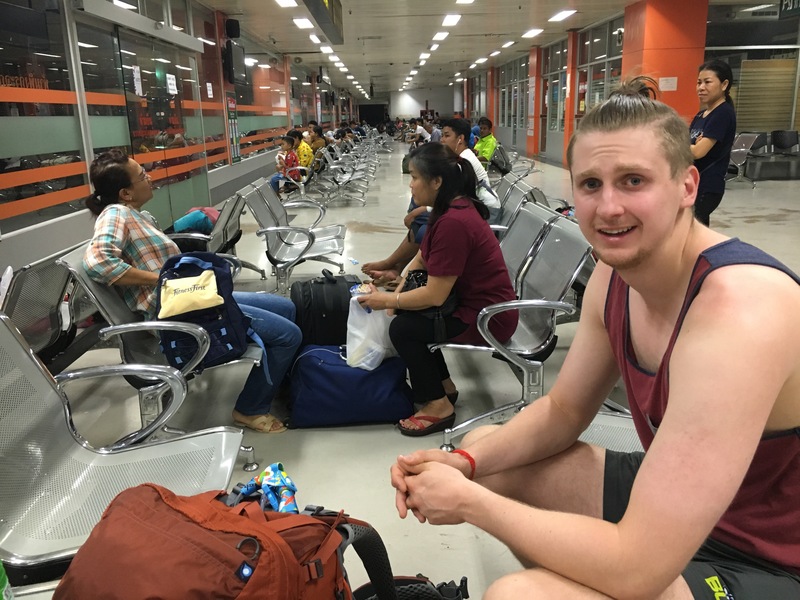 Whether or not it was a genuine visa remained to be seen and after having to hand over a further $20 for the privilege of having our passports back, we were frogmarched to the queue to get stamped out of Thailand and in to Cambodia. so much for ‘seasoned traveller’. It was 10:25 by the time we got through: the other people on the bus had breezed through the border and by the time we were sighted again, everyone was a little twitchy, with the bus driver barely waiting for us to be on the bus before pulling off. But the bus had waited. Gold stars for Nattakan. Points deducted for dropping us off at the point where we’d be swarmed. We were safe, we had got through and no one had taken any more money from us. As soon as we were back on the bus and moving this sense of relief washed over me. I felt like I could breathe. I felt safe again. I put my head on Zac’s shoulder and he stroked my arm. 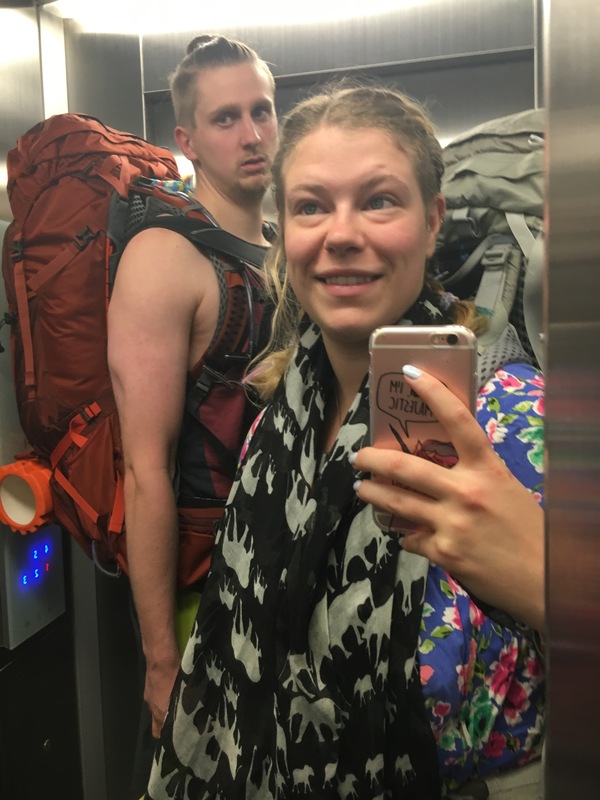 Thailand for us was ruined by tourism, the assumption that Westerners were there to make money from, we saw nothing that we felt was authentic, was ‘real’, we’d been emotionally and financially drained and we’d been there less than 72 hours. Swept up in the Bangkok bubble, we’d been wrong to believe the hype about Asia, that the people were friendly and welcoming, that they were genuine, that they could be trusted. I’d let my guard down and ignored my usually well honed travel instincts. I’m not the first, won’t be the last. Our return flight to Australia leaves from Bangkok. We have to go back, but we’re thinking about planning our stay away from the city. We wanted to head to the islands anyway, but perhaps we’ll be there the whole time, just coming back for the flight. Hopefully time and space will endear Thailand to us again, but for now, if we never go back it’ll be too soon.